As we were in the mood for French food tonight, my sister and I decided to pay a visit to Sebastien's at Greenwood Avenue, a fairly new French bistro, which was very conveniently open from Monday to Sunday. It's run by its eponymous owner Sebastien Reullier, another Frenchman who has found success in the Singaporean food industry. When we got there, I was really surprised to see how crowded it was, especially on a Sunday evening. Generally though, a crowded restaurant is a good sign, assuming you ever manage to find a parking lot, which we did eventually. It was even more packed inside then I had imagined. Thankfully, we were still seated promptly, and bread arrived seconds after we were seated, I kid you not. I was very impressed. Unfortunately, the bread could do with some work, as it was crusty beyond reasonable expectation. I took a walk around, and was astonished to see that the gourmet shop that used to adjoin the restaurant had been replaced by a wine shop, and the gourmet store, rather than closing down, had simply moved to a new location. Coupled with the obvious popularity of his restaurant, it's a clear sign that Mr. Reullier has hit paydirt. 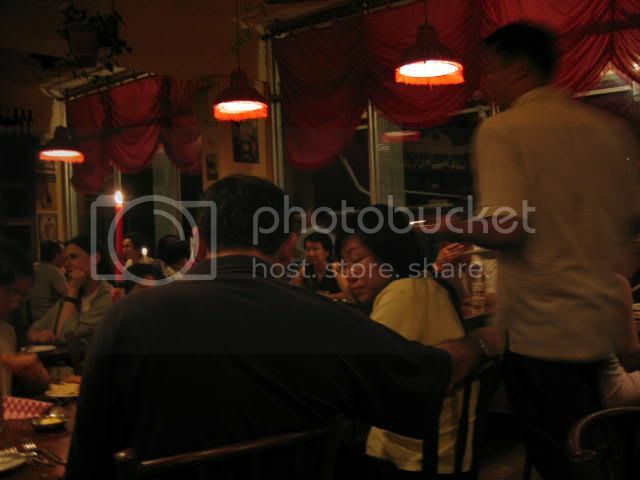 True to form, Sebastien's serves traditional bistro favourites like boeuf bourguignon and pot-au-feu. While the prices here are not exactly bargains, they are pretty reasonable. But enough of that, let's get to the good stuff. To start, I had the Cassolette D'Escargots aux Champignons et Beurre Parseille, or baked escargots with mushroom and parsley butter ($15). 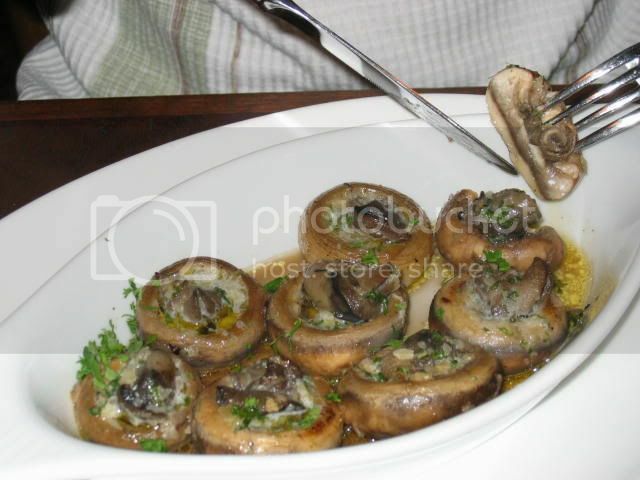 The escargots were stuffed into cremini mushroom caps and baked. Now, I'm not very fond of baked mushrooms, as they tend to dry out in the oven. These were no exception, and the whole thing was a bit on the bland side, which I felt had something to do with the departure from the traditional garlic butter to parsley. All in all, I thought it was rather comme si comme ça (3/5). On the upside, they're fairly generous with the snails, providing eight instead of the usual six. For the main course, I was originally going to order the boeuf bourguignon, until I espied an entry on the menu that read Riz de Veaux... I thought it was rice with veal, but it turned out to be sweetbreads, which I am sure are Ris de Veau, but pardon my French. I'd been searching for a place that served sweetbreads for ever, but apparently they were unavailable. Dammit. 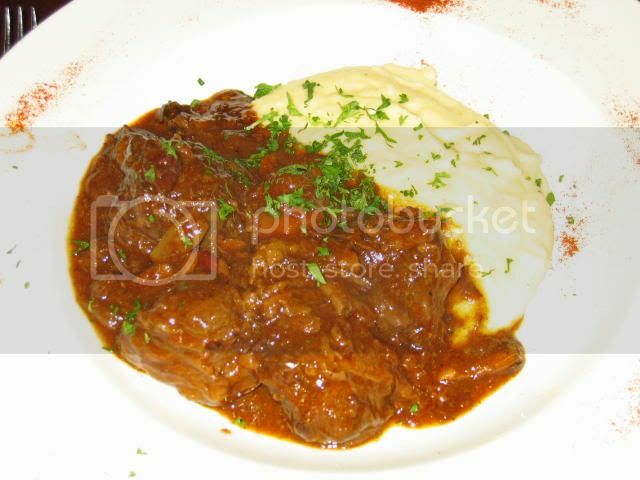 Oh well, the boeuf bourguignon ($28) was a chunky beef stew that came with mashed potatoes. I've been meaning to make this myself, so I wanted to see what it was supposed to look like before attempting it. It's basically a beef stew with lots of red wine. Sebastien's version was authentically French, right down to the lardons in the stew. The beef came apart easily, and the portion was just about right. My only gripe was that the tomato paste was a little too overwhelming, masking the taste of the wine. The mashed potatoes were delightfully creamy, and the entire dish was very satisfying (4/5). I did think, though, that if Sebastien priced dishes like this a little lower, he'd soon have more customers than his restaurant could accomodate. When it came to dessert, I had no doubt whatsoever what I was going to order. I absolutely had to have the Ile Flottante ($7). It was almost mocking me. I was determined to see what a proper floating island should look like and if it was worth the trouble I took to make it. I even asked the waitress if the meringue was baked, like a true French Floating Island, or poached, a la an English Floating Island. All she could tell me was that it was fluffy, like a marshmallow. I needn't have worried. 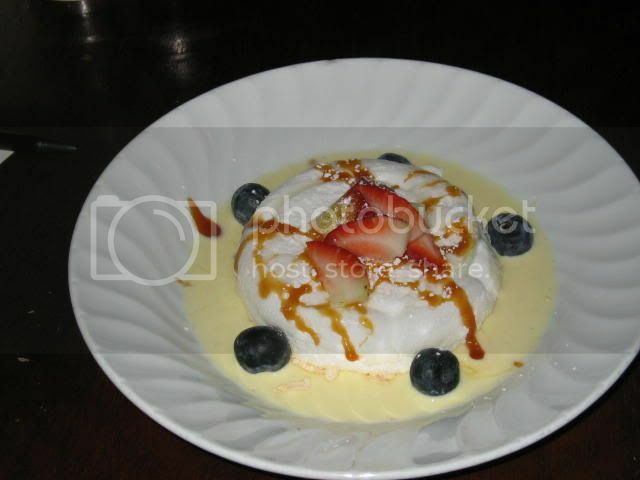 The floating island came out just as I thought it should, a pristine mound of snow-white floating elegantly in a pool of creme anglaise, decorated artfully with caramel streaks, strawberries and blueberries. One bite and I decided this was one of the most brilliant desserts ever devised and executed (5/5). The meringue was indeed baked (of course), and it was fluffy and sweet, just like a giant marshmallow. It had absolutely no hint of egginess about it, and its ephemeral sweetness contrasted superbly with the gentle custard sauce. Even my sister was converted, after her initial suspicion that it "looked weird". I have to make this again. Mr. Reuiller, if you read this, be so kind as to give me the recipe! At $7, it's a steal. In terms of ambience, Sebastien's exudes all the quaintness of an authentic French bistro, right down to the piped music and convivial atmosphere (although some of the red curtains and light-shades did make it look a bit like a bordello). At its fullest, the restaurant had about thirty people eating and chattering, though thankfully with very few small children to mar the experience. The location in Greenwood Avenue is certainly convenient, only a few minutes off the main Bukit Timah thoroughfare. I like the way all these eateries are starting to spring up in otherwise quiet housing estates. It's somehow very pastoral. Clearly, as the place is owner-run, service is pretty decent. Sebastien himself is very on the ball, personally seeing to every table, but the waiters could do with a little more training. See also the account of a birthday dinner held at Sebastien's. Overall: J'ai passé un bon dîner!